We’d love your help. 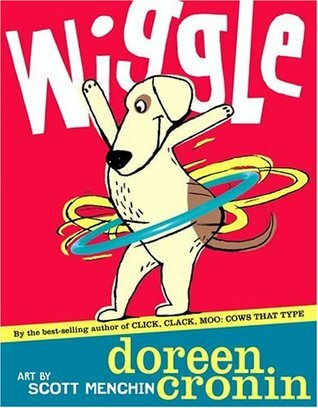 Let us know what’s wrong with this preview of Wiggle by Doreen Cronin. For energetic toddlers (are there any who aren't? ), here's a book that invites them to wiggle along with the story. Told in rollicky, wiggly rhyme that begs to be read again and again, Doreen Cronin's latest romp will have toddlers wiggling, giggling, and then (hopefully) falling into bed, blissfully exhausted! To ask other readers questions about Wiggle, please sign up. 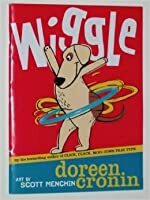 Wiggle was the greatest book I have ever read because the story was intense and action packed with a dog wiggling during his everyday life and in nature. Wiggle teaches many lessons like to wiggle out of bed. Wiggle is the best book ever made. How funny, as I read the book, I couldn't help wiggling! This is an action packed story about a dog wiggling everywhere and everything. This would be a lot of fun to read with kids 2-6... just watch out for the page about wiggling in the underwear! Featured in a dance themed story time I attended with my 2 year old! 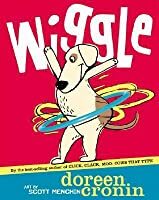 In the book, Wiggle by Doreen Cronin, is about a cute little dog that is highly entergetic. The dog is the main character whom shows us that he for sure loves to wiggle every time of the day. Wiggle can show us that it is good to have a 'wiggle' every one in a while and that it is good to make someone happy like that. As a result, the book is very cute and funny and I highly reccomend it for a laugh. This book is about a dog who likes to wiggle alot. This book is not a good book to read, i personally think it is a waist of time, but i needed 5.0 points so i read it. The dog is the main character and he wiggles every where. He literally wiggles in every page of the book. I dont suggest this book to any of you. This book is about a dog who likes to wiggle alot. This book is not a good book to read, i personally think it is a waist of time, but i needed 5.0 points so i read it. The dog is the main character and he wiggles every where. He literally wiggles in every page of the book. I don´t suggest this book to any of you. I read this through tumblebooks.com so there was audio. This is a cute book to keep PK-2nd graders enjoying books. It has a jiggling rhyme throughout. It would be a good choice for an active story time. Children could sing and act along with the book. This book also received an award BCCB Blue Ribbon Picture book Award. Wiggle is a good book. It is about a little dog. I have read this many times. I enjoy it a lot.In the book the dog does shows us all the places you can wiggle such as your bed. Overall this a great children's book. This review only needs 3 words, but it deserves more. Best Book Ever. I don't care that this book is meant for little kids. 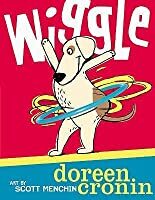 I enjoyed it and will cross my fingers for more funny children's books by Doreen Cronin. I can't believe the dog wiggle from his tail to his HAIR! We liked this book-- it was funny and cute. This wasn't as good as Cows or Duck. This book is about a dog that likes to wiggle and wiggles all the time in many different places with many different animals. I really didn't like this book that much. It kind of felt like the author was trying to write in the style of Dr. Seuss, but it didn't turn out that well. There's really no point or moral to the story; it's really not even a story at all. I don't think I would have this book in my classroom, because it sounds more like a book a mom would read to her 2- or 3-year-old child a This book is about a dog that likes to wiggle and wiggles all the time in many different places with many different animals. This picture book is perfect for active kiddos: they won't be able to sit still for storytime with this one and will want to wiggle right along, which is A-OK. I don't love the illustrations--there's some creative use of photos meshed with cartoons that just didn't work for me here, but there's an undeniable energy to the book as a whole that kids will love. Perfect for this year's summer library program theme Libraries Rock. "Wiggle" is an engaging story with bold illustrations and fun rhymes (...including hair and underwear) that will have young audiences smiling and moving. It's the perfect addition to books addressing "exercise" and/or "movement," yet with a playful, lighthearted tone. The perfect complement to Bill Martin Jr.'s "Spunky Little Monkey." Full of energy and whimsy, this book is a great one to help the active listeners get their wiggles out with movement and rhyme. This would be a great one to include for storytime when the wiggles have begun or would make for a terrific choice for an inclusive storytime. 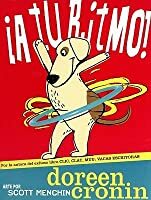 No estoy segura de que tan bien se traduce al espanol, pero estaria dificil leer bilingue (o tal vez deberia de leer tambien la version en ingles)...siento que la rima es un poco torpe, pero estaria bien para que actuen con el perrito para sacar los wiggles. My special needs grown son giggled through this book as I read it to him. Mostly because the main character was a dog wiggling throughout the story. Each page he is 'wiggle' on something and everything. Simple storybook. B2B aka Books to Boogie, aka a dancing interactive storytime book. I'd skip a few pages in the first third, but otherwise, you could have the kids making all the movements/actions right along with you. This is a fun rhyming book that was a good vocabulary builder for preschoolers. I wish it was more inviting to move along—the kids were not as active as they are when I’ve read From Head to Toe by Eric Carle. Another fun movement book in the series by Doreen Cronin and Scott Menchin. This one starts at the beginning of the day and ends at bedtime. This would be a great book for a daycare or a very young child to talk about movement and be silly with wiggling. I didn't love the illustrations in this as much as I have in many of Cronin's other books (I'm assuming books with different illustrators). Overall a cute, quick read. Combine wiggling around with animals...cute book. A great book to read just before bed. Helps the little ones get their wiggles out before going to sleep. Super simple text. Unique combination of illustration and digital art. We love Doreen Cronin. This one is super easy to incorporate actions with. Be prepared to wiggle in a variety of different ways! Great motion for a fun and active read-aloud. Would be great for little ones. Definitely one of my favorites to read at storytime. Love wiggling with everyone! Doreen Cronin was a practicing attorney in Manhattan when her first book Click, Clack Moo: Cows That Type became a publishing success. But her book was not published overnight. In fact, she had written this barnyard tale even before attending law school but only received rejection letters from publishers. Five years after submitting the original manuscript she got a call from a publisher who wante Doreen Cronin was a practicing attorney in Manhattan when her first book Click, Clack Moo: Cows That Type became a publishing success. But her book was not published overnight. In fact, she had written this barnyard tale even before attending law school but only received rejection letters from publishers. Five years after submitting the original manuscript she got a call from a publisher who wanted to turn her story into a book and the rest is history! The busy life of a writer left no room for courtroom litigation and arbitration so Doreen made the leap to being a full-time children’s book author. She then teamed up once again with illustrator Betsy Lewin to write another hilarious barnyard tale, Giggle, Giggle, Quack, that continues the escapades of these lovable animals on a farm. In Doreen’s latest book, Diary of a Worm, she explores the daily life of a lovable worm. Who knew that the underground dwellings and activities of worms could be so funny? Readers may even find that worm’s life is much the same as theirs except worm eats his homework and his head looks a whole lot like his rear!